VT18 may be over, but the 2019 trip is already on the horizon. Applications are now open for the Varsity Trip 2019 Committee, and we couldn’t be more excited. We are looking for 8 talented Oxbridge students to join us in creating what we hope will be the best trip yet. There are a variety of roles open for application, each requiring different skill sets, all requiring a love of Varsity Trip. See below for details of each of the roles open for application. If you can’t decide on just one role to apply for, you can apply for up to two different roles. Successful candidates will be invited to interviews held in both Oxford and Cambridge. ‍Applications close 23:59 on 26th January. The Finance Director is in charge of looking after the accounts and budgeting for the entire trip. As a limited company, and with the largest budget of any student-run organisation in Oxbridge, it’s a big responsibility. It requires a meticulous eye for detail, careful organisation and, of course, excellent arithmetic ability. Proficiency with Google Sheets/Excel is a must. The Technical Director is responsible for maintaining the varied equipment needed to run Varsity Trip throughout the year. They’ll be a real Tech-Head with experience using Google Suite, Mail Merge, and Website Design. An interest in both computer software and hardware is essential. Web coding experience is useful but by no means necessary. Two of the biggest parties of the Oxbridge calendar take place in the alps each December and are organised by our Productions Director. With a sizeable budget and a reputation of good times to uphold we need somebody with ambition and vision to make ONP and FNP 2019 our best yet. The PD will also be looking after the most important thing after a long day skiing: Après. An eye for detail and a love of throwing a party are key for this role. 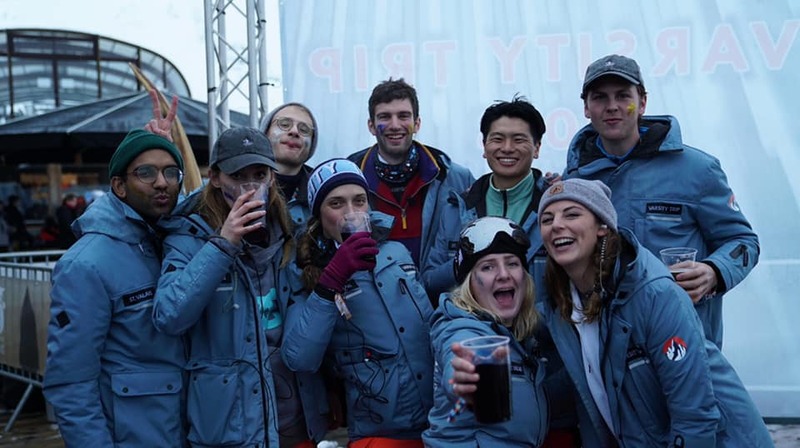 Varsity Trip is about more than just skiing, and a huge proportion of this is down to our incredibly varied midweek events and the Varsity Ski Races. This year saw Come Dine VT and the Variety Show making their debuts as well as the return of old classics like the Mountain Meal. In our Events Director we’re looking for wacky creativity in coming up with new events as well as excellent organisation and planning skills for the Races. No ski race experience is needed for this role! The Design Director has one of the most rewarding roles on the Committee: the ability to see their designs come to life all over the place. From the website to stash there’s few parts of the trip where they don’t have some influence. They’ll have a load of art and design experience, from graphics to watercolours and anything/everything in between. They’ll also be bursting with a whole host of fresh ideas and looks to bring to the trip in 2019. Note: if applying for this role, please attach 3-5 examples of your best artwork (this does not have to be promotional work, we just want to see your skill!) to your cover a letter. A small portfolio may be needed at interview stage. Logistics Director is a hugely varied role, involving orchestrating Varsity Trip’s superb assortment of merchandise and goodies, taking charge of getting word out about the Trip on social media or with promotional materials, and acquiring sponsorship for some of our best events and competitions. From dealing with suppliers, to writing posts, to negotiating with large companies - they’ll be able to quickly switch from one thing to the next. Ideally they’ll have experience in communicating with companies, an ability to think on their feet, and an abundance of ideas for the next biggest VT Stash item. What would a good Uni Ski Trip be without anything to prove you were there!? The Media Director will be a keen Photographer and Videographer with experience in all aspects of Photographic media; from taking photos, to framing shots, storyboarding and editing. Novel ideas, imagination and skill with any editing software are crucial. A small portfolio may be needed at a later date. The College Reps Coordinator’s responsibility is primarily to recruit and supervise the 60 or so College Reps and 20 Ambassadors, ensuring that they’re answering as many questions about the trip as they can within their College. The role is really about informing participants and Reps, so excellent people management and communication skills are essential for this role. A good memory for names helps too! They are also in charge of answering any questions that come through the Facebook Page or by email and so need to be organised in responding to messages. This role will likely go to a previous College Rep but anybody can apply. VP this year is an executive position alongside the role you have applied for. The VP needs to be great with managing people and keeping on top of many things at once as well as being level headed and decisive. If you’re interested in becoming Vice President then simply tick the relevant box on the Google Form saying you’re interested! There’s no commitment to do it if we do ask you to join the Committee - it’s simply to gauge interest at the moment. To apply, click below by 23:59 on 26/01/2019.